Without ads, many good Web sites wouldn’t exist, so I favor having ads and supporting sponsors. But distracting ads can make it difficult to actually read some sites. That’s where GlimmerBlocker comes in. 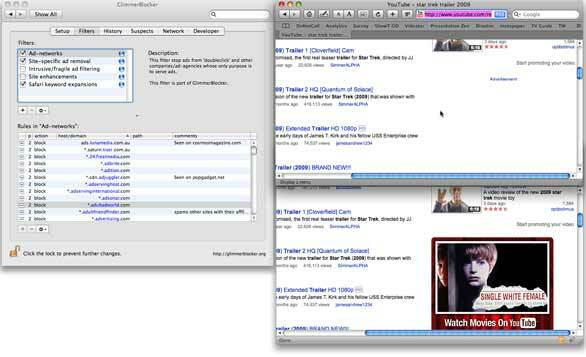 GlimmerBlocker is an ad blocker that is safe to install because it doesn’t hack Safari. You’ll be able to update Safari without a problem. The utility works via a proxy server (a Web server go-between) to intercept your browser’s calls for some ads. GlimmerBlocker appears as a System Preferences pane. Its default settings are immediately helpful for average users. A hidden feature in GlimmerBlocker lets you define keywords so you can quickly search sites from the address bar. While some ad blockers may block too much, GlimmerBlocker chooses not to cripple Web sites. Ideally, GlimmerBlocker would filter only flashy ads, leaving the rest for you to see. However, this would make performance defeatingly slow. Instead, GlimmerBlocker blocks known ad servers, which means nice ads are blocked as well. And if a site serves its own ads, even obnoxious ones will be seen. Google’s text ads are not blocked. You can set GlimmerBlocker to allow the ads on a site, and you can also enter an specific ad exception for a site in GlimmerBlocker’s preferences. GlimmerBlocker can be highly customized, and if you’re tech-savvy you can add more filters or functions. 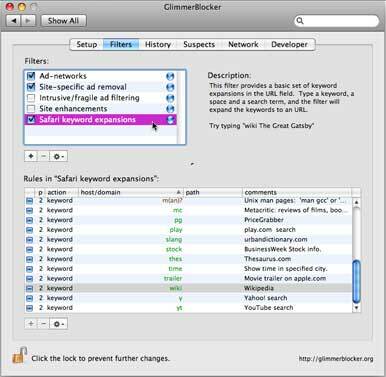 A unexpected gem of a feature is GlimmerBlocker’s Safari keyword expansions. These enable you to type shortcut search terms into Safari’s address field; after you press Return on your keyboard, Safari loads a related Web location. For example, entering wiki Macintosh takes you to the Wikipedia entry for Macintosh; fb provides a Facebook search. GlimmerBlocker’s Filters tab (in the software’s preferences) has a list of the many shortcuts. GlimmerBlocker and a popular Web site in Safari with ad blocking (top right) and FireFox without (lower right). GlimmerBlocker is safe and welcome, although I have mixed feelings about blocking unobtrusive ads. My dream app would simply display only the first frame of every moving ad instead, so I’ll keep hoping for it.